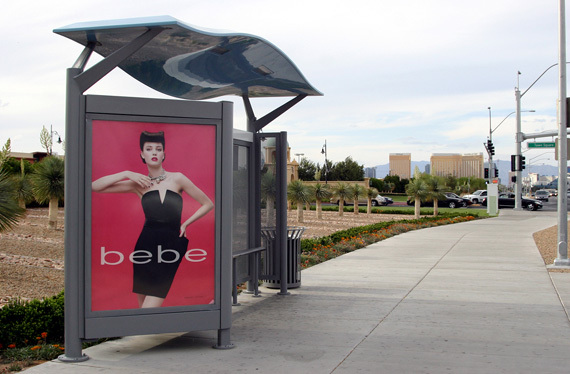 The Regional Transportation Commission of Southern Nevada (RTC) has undertaken a new marketing campaign urging residents to “make a difference by using public transportation one day a month.” The claim is that we’ll all save gas, save money and save our valley. Not a bad message in today’s economy, so I decide to give it a shot. On a near-perfect Sunday in April, my wife drops me off at the bus stop nearest our house at East Flamingo and Sandhill. My plan, if you can call it that, is to jump on the first bus that comes along and ride it about 12 miles west to Fort Apache Road, then take a connecting bus north to J.C. Wooloughan’s, the fine Irish pub housed in the Rampart Casino. As long as I’m not driving, a couple of pints of Boddingtons and a corned beef sandwich sound like just the ticket. My wife, a former travel agent, is appalled by my lack of preparation. She makes me print out a schedule from the RTC Web site, but all those numbers look like pi carried to the thousandth place. “Schedule?” I tell her. “I don’t need no stinkin’ schedule.” Besides, I’ve got a wallet full of singles and a pocket full of quarters. Not to mention my cell phone. How much trouble can I get into, anyway? My wife simply rolls her eyes and shakes her head, something I’ve seen more times than I care to remember. Other than the cable cars in San Francisco, the streetcars in New Orleans, and the subway in New York City, I haven’t ridden on public transportation since I was a small boy in Detroit. That’s when my Aunt Belle, a timid soul who never learned to drive, took me shopping at Northland via the municipal bus system. I thought it was the coolest thing in the world. So I’m curious and even a bit excited by the prospect of my little city adventure. Within two minutes, a bus squeals to a halt at my stop. It’s a Deuce (technically, an Alexander Dennis Enviro500), one of the double-decker jobs imported from England. They’ve been running locally since 2005, first on the Strip and more recently on some of the major residential routes. I climb aboard, deposit $1.75 in the slot (I could have bought an all-day pass for $4 ahead of time but that would have required, you know, planning), and climb the stairs up top. It’s 10:44 in the morning and the bus is sparsely populated. I grab a seat near the front and position myself to enjoy the scenery out the big panoramic window. Surprise No. 1: The bus is clean. I’m not sure what I was expecting, possibly chickens and pigs running up and down the aisles. Surprise No. 2: The bus is comfortable. The blue cloth seats are relatively spacious, certainly roomier than their airline counterparts. Granted, I’m not heading to work during rush hour (I’ve heard that can get dicey), but so far this ain’t half bad. No surprise: The bus is slow. On many occasions I’ve been stuck behind one as it clogs the right-hand lane, taking forever to load and unload passengers. Today, it’s nice to be the clogger, not the cloggee. Heading west on Flamingo, we stop every few blocks to pick up a new group of riders. The closer we come to the Strip, the more crowded we get. An authoritative recorded female voice announces our bus number and route, transfer instructions and other relevant info (“Now approaching Desert Springs Hospital”), along with a warning to “Stand clear of doors opening and closing.” You wouldn’t want to mess with the person behind that voice. The passengers are mostly young and old, a diverse cross-section of humanity: Hispanic, Asian, African-American. The veterans bring books, listen to iPods, chatter away in various languages on their cell phones. I strike up a conversation with Doug, a roly-poly man of 60 with curly gray hair and a shopping bag full of potatoes (“Ten pounds for a dollar at Mariana’s Supermarket”). Doug lives near the Hard Rock Hotel, plays low-limit poker at Bill’s Casino “because the tourists don’t seem to mind losing.” He is saving up the $1,000 entry fee for the senior tournament at the World Series of Poker. Doug departs at the Strip. I’ve now been on the bus for 30 leisurely minutes. We roll past the Flamingo, Rio, Gold Coast. An elderly woman in front of me starts hacking and sneezing. I move back a few rows, where I overhear three middle-aged ladies from the Seattle area discussing their upcoming trip to the quilt store. “At least it gets us out of the casinos for a while,” one says. At 11:35 I push the orange button requesting a stop at Fort Apache. So far, so good. As I watch the bus pull away from the curb (cutting off a black Trans Am), I experience an odd rush of freedom. Being carless makes me feel like a visitor in my own town. With a spring in my step, I head north to catch my connecting bus. Fifteen minutes later, and with considerably less spring, I realize I haven’t seen a bus or bus stop yet. Basically, I have two choices: soldier on or retrace my route. I decide to go back. Surely there’s a stop between Flamingo and Tropicana. Or not. (That sound you hear is my wife laughing.) Time for Plan B. Abandoning the whole Wooloughan’s idea, I duck into a Northside Nathan’s, home of Detroit-style pizza. (For you Michigan ex-pats, it’s patterned after Buddy’s.) Suitably refreshed and re-nourished, I make my way over the I-215 bridge to Tropicana, where I at last find a bus stop. Or at least a small sign on a pole indicating I can catch an eastbound bus that will eventually take me close to my starting point. “Should be here in about five minutes,” he tells me. “Take the bus often?” I ask. The bus comes along right on time. 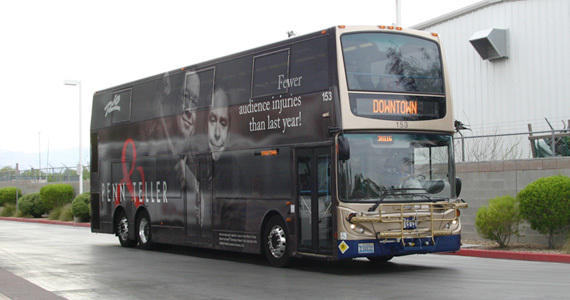 This is a different kind of bus, a long stretch model with an accordion middle. 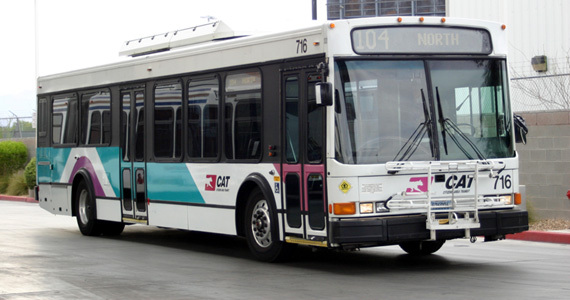 (The RTC Web site lists at least 17 different models in its active fleet.) With my feet throbbing, I plop myself down across from a young couple singing an Elliott Smith tune in decent two-part harmony. Meet Derek and Tana. They commute daily from Fort Apache to the Strip, where he sets up shop as a street performer working for tips on the Tropicana pedestrian bridge. He’s an ex-IT guy from Pasadena looking to make a living here doing “this and that.” I give them a couple of bucks to get their day off on the right note. At Trop and Rainbow, we pick up Clarice, a 29-year-old unemployed Brazilian woman who has just returned from her grandmother’s funeral to find her roommate gone. Along with her car. Despite the rough patch, she’s surprisingly upbeat. “I guess it’s time to start fresh,” she says with a smile. As we approach my part of town, I find myself reflecting on the people I’ve met and the stories I’ve heard. In the past, I’ve stared at buses from the solitude of my truck and wondered about the poor saps who ride them. Not any more. I now realize these are folks just like you and me. A little down on their luck, perhaps, but no different, really. Whether by necessity or by choice, the bus isn’t such a bad way to go. Thanks for the great article! I used to take the bus much more back during my college days, but I haven’t boarded it as much lately. When I lived by the 95 and Flamingo, it seemed way more convenient, but I really should find a new route from my new abode. Brian, another good one; but have to admit, I only do the public transport thing when I’m “out of country” – it’s hard to beat Europe when it comes to public transportation. When we first moved here (1999), Megan and I made a point of riding every route to the end-of-the-line and back. For the first year or so, we both had monthly passes and used the CAT system frequently. I haven’t used the bus system as much recently, but I still am intrigued with the way the routing system expands and responds to the still-developing valley. Great article and I think it’s about time for me to do another end-of-the-run ride (that would take the better part of several days I would guess) and see what there is to see these days. …And if you’ve never rode the Deuce on the strip… you gotta do it, the seats on the upper deck — at the front — are awesome. 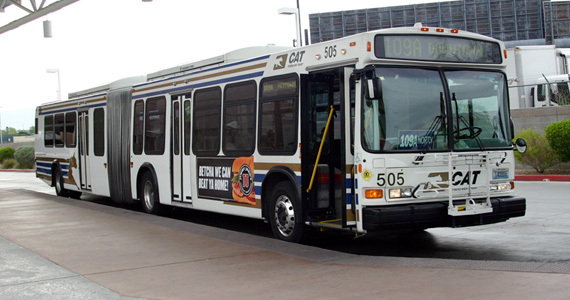 I haven’t ridden a CAT bus in quite a while, but what I remember most fondly are the conversations you overhear and the people you meet. One time a guy got on that everybody on the bus recognized because he had appeared in TV ads for a personal injury attorney in town. Turned out he was also a Ferengi at the Star Trek experience. You just don’t get interactions like that in your car. I could have told you there’s no bus that far south on Ft Apache. In fact there are pretty much no busses outside of the beltway and not a one south of about Russel Rd/South 215 and West of the 15 freeways. So for me, and thousands of others that live in the SW end of town (Mountain’s Edge/Rhodes Ranch/Southern Highlands) the buss is not an option. Wish it were an option….I like taking the bus! Great article! Your voicing is great, Brian. I enjoyed hearing the small details that make a difference in your experience; the kind of thing I’d forget to include if I were writing. I remember riding the CAT to my lifeguarding job at Wet n’ Wild, before they started using even the stretch buses, let alone the double deckers, on the Strip. Those were some seriously crowded buses, and riding along Las Vegas Blvd near Washington, there were times I wished I could have stood just a _little_ further away from some other patrons. It sounds like they’ve really polished up their act recently, in an effort to appeal to the larger population. Good- Las Vegas needs better public transportation. Thanks Brian. Took me a while to respond, but now that I have all of the wonderful amenities a normal household might have I have ample opportunity to search internet articles with my name in them. Very well written and impressive. Keep up the good work. Great to hear from you guys. Glad you’re doing well. Happy holidays! Keep in touch.